I am talking about no stir polenta! Leave it in the oven and it will cook itself. No stirring, no splattering, no spitting! Sound good? I love polenta but I avoid making it because it's too labor intensive. I don't want to be standing in front of the stove, continuously stirring thick polenta that will spit at me. But cornmeal (polenta) is very inexpensive and is a great way to feed a crowd. It's versatile and perfect for holiday parties. This cooking method solves all of those problems associated with stove top cooking.. I have some ratios in my head when it comes to cooking. When I cook polenta, the ratio is one part cornmeal to three parts water or broth, the same ratio as when I make garbanzo bean fritters (that's another story). This ratio will yield firm polenta, the kind that will set when cold. After it's chilled, cut it into pieces and pan fry it before topping it with tomato sauce, creamy sausage and mushroom sauce, or some greens, etc. This can also be used instead of toast as appetizers for your gluten-free guests. If you want soft polenta, the kind you plop on your plate similar to mashed potatoes, the ratio will be 1:5. That is one part cornmeal and 5 parts liquid, preferably broth. First preheat the oven to 350F. Grease a 4 quart or larger dutch oven, then add 2 cups medium coarse ground cornmeal, 6-10 cups of broth (depending upon how soft you want your polenta to be), preferably low-salt broth, 2 tablespoons soft butter and 2 teaspoons salt, mix well. It doesn't look like it's going to work but have faith. Bake uncovered for one hour and a half. It will take only an hour if you use fine ground cornmeal. Using a long handle spoon, stir the mixture a couple of times during cooking. The polenta will be creamy and soft. Magical! Take the cooked polenta out of the oven, stir it well and adjust seasonings: Does it need salt? I will definitely add more butter and Parmesan cheese. Butter makes everything better! If you are making firm polenta, grease a 9x13 baking pan and pour the hot polenta into the prepared pan. Use a spatula to smooth out the top. Sprinkle some Parmesan cheese on top if you want. Let it cool completely before cutting into pieces. If you make soft polenta, serve immediately. Soft polenta doesn't wait for anyone. 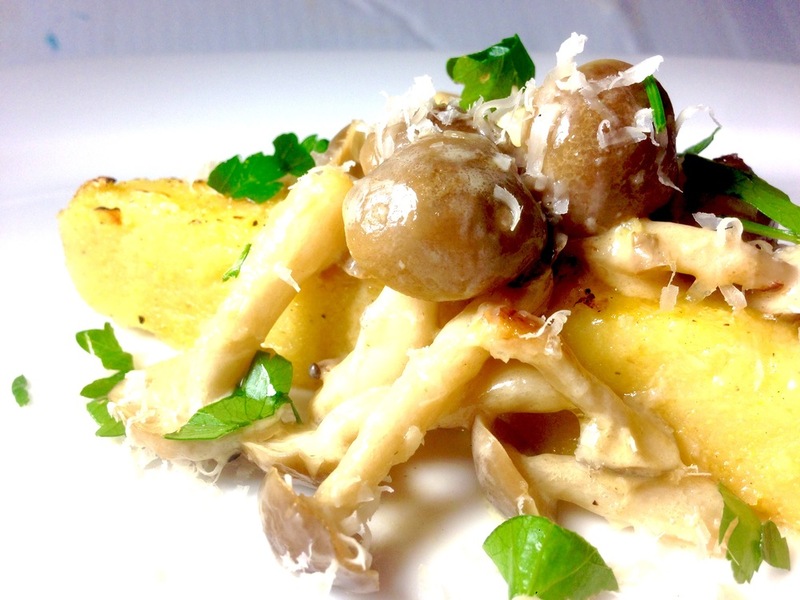 Pan-fried polenta, Bunashimeji mushroom sauce with truffle oil! Cooled polenta waiting to be cut.